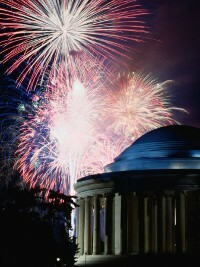 If you've never seen fireworks in the nation's capital from the water, don't miss it! Join us for a fun and spectacular evening. 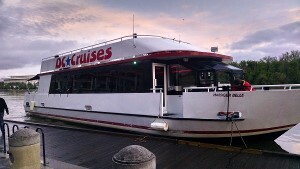 We'll first cruise along the monuments at sunset, and then position the boat in the ideal spot for the fireworks. After the show, we'll cruise back and see the illuminated Monuments reflect off the water, a breathtaking site too! Note: Due to a mechanical issue, this cruise will take place on the single deck boat (if you purchased tickets, please check for an email from us) Our cruise boat is an upscale cruiser with comfortable seating, heating/cooling, bathrooms, panoramic windows and indoor and outdoors decks. Your cruise includes complimentary non-alcohol beverages, and cherry champagne for adults. Tickets are non-refundable and sales are final. It is up to the discretion of the National Park Service if the fireworks are postponed. Our cruise proceeds rain or shine, with fireworks or without (If the fireworks are postponed, you will have the option of going on that date instead).